If you are a business subject to OSHA regulations, now is the time of year that businesses are required to post a yearly report of workplace-related injuries and illnesses. The summary must be posted in a common area where all employees can see it. Doing this keeps your employees aware of dangers in the workplace. As an employer, make sure you know how to keep records and to post the yearly summaries. Safety is important, and so is following regulations! All the forms can be found here, but a summary of what you need to know is below. The 300A form is known as the Injury and Illness Recordkeeping Forms. Form 300A summarizes job-related injuries and illnesses, which should be logged on the OSHA 300 Log. After a year of logging illnesses and injuries, employers should post the form 300A summary for all employees to see. Who needs to fill it out? Most employers who have ten or more employees will have to fill out the form. 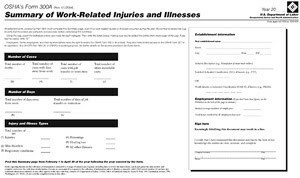 If your establishment has a chance of any sort of workplace injury or illness, you likely need to fill out the form. OSHA has also updated its list of newly included establishments that will need to keep records. To check to see if your industry is on the list, click here. Who is exempt from the requirement? If you have fewer than ten employees, you do not have to fulfill this OSHA requirement. Certain workplaces that are deemed low-hazard are also exempt, like shoe stores, book stores, florists, and publishers. You can find a full list of low-hazard workplaces here. When is the deadline for reporting? Notices must be posted each year between February 1 and April 30, so now is the time! At Total Fire and Safety, we are dedicated to helping your business meet all safety requirements and helping you prevent workplace related injuries and illnesses. In addition to commercial fire safety, we offer onsite first aid kits and employee safety training. If you have questions or concerns about OSHA requirements or any other question related to workplace safety, feel free to contact Total Fire & Safety at 630-960-5060. If you visit the TFS headquarters in Woodridge, Illinois, make sure you take a look at our newly remodeled training room. 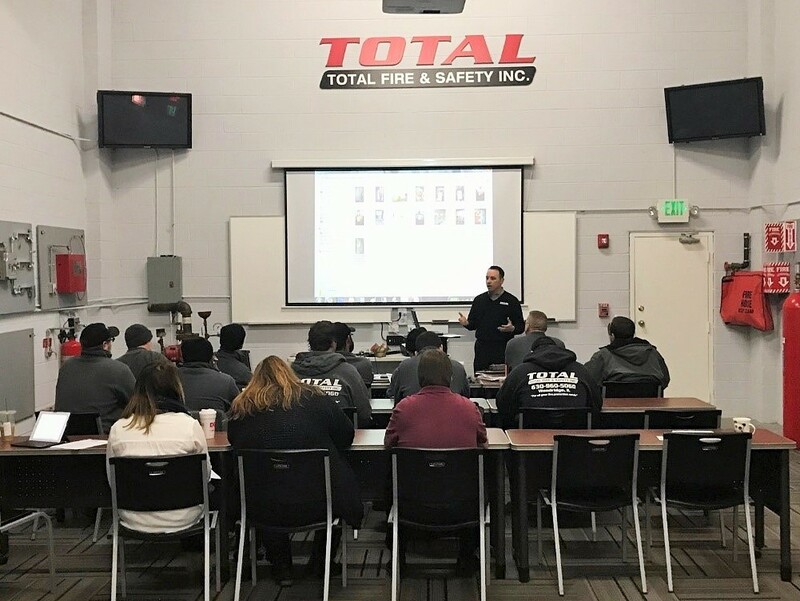 Training is essential to what we do at Total Fire & Safety, not only for new employees but to help existing ones stay up-to-date on the latest hazards, fire codes and prevention techniques. Our existing employees know the training room well. This is a picture of our fire extinguisher division meeting. Every month, each division of Total Fire & Safety, fire extinguisher, sprinkler, fire alarm and backflow, meet for monthly training and information exchange sessions. By gathering together, our team in each division can share information about their experiences in the field and discuss what is working or needs to be improved. Each division has their own concern with fire safety, so holding these division exclusive meetings is very helpful. Who benefits most from these meetings? The TFS customer! These meetings are one of many ways TFS is always trying to become more efficient and stay abreast of the latest in fire prevention and NFPA codes for their customers. The meetings help Total Fire & Safety deliver their very best in expertise, installation, maintenance and customer service to all our wonderful customers. Thank you to all of our customers for making 2016 a great year for us. We promise to do everything we can as your commercial fire protection company to make 2017 a safe one for your commercial fire safety. If you have any questions about fire safety for your business or want to update your fire equipment going into the new year, don’t hesitate to contact us at 630-960-5060.